I got a little more progress on "My Lady's Quaker." I also decided to pull out an old UFO. Carriage House Samplings Alphabet. I started this when I was pregnant with Matthew (over three years ago) and decided to get it back out after seeing Siobhan's beautiful framed piece. I would love to get this one finished up! I also went to my local quilt shop (People, Places and Quilts) today. It's a beautiful shop in historic Summerville. I got some backing and binding fabric for my table topper. I got the blue for the back and the brown for the binding. I also picked up a few fat quarters while I was there. All the fabric I got is from the Moda Figgy Pudding line. Tomorrow I'm going to Amy's to stitch and shop! I can't wait for that!! It's been a long time since I've been away (without kids). I need it!! Write Later! I am loving this project! What a beautiful design! I may have to have it for myself! And your fabric shopping looks like it was a total success. Have fun with Amy! Beautiful stitching as always Nicole. Love your new fabric. Hope that you have a great day to yourself stitching!! It always does one good to get away and spend the time on something you love. everything is gorgeous!!! I love the fabrics you chose to go with the quilt top! Beautiful! I love the SAL piece you are doing. I want to do that one so bad myself!!!! Need to finish baby sampler, need to finish baby sampler!!! I love your blog and quaker gal! I would like to stitch one too using the same colours. What would be a good website to order the pattern from? Jennifer you can download the pattern through the Jarden Prive site, or Amy from Down Sunshine Lane is now carrying the paper pattern. Nicole, you started the alphabet from the top! Great progress, Nicole!! I particularly like the animal alphabet sampler. 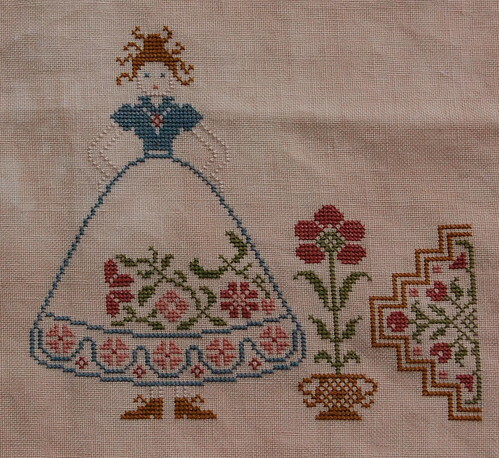 I've seen it stitched before and it is very lovely! Good choice! Love your WIPs! The colors on the Quaker are marvelous. 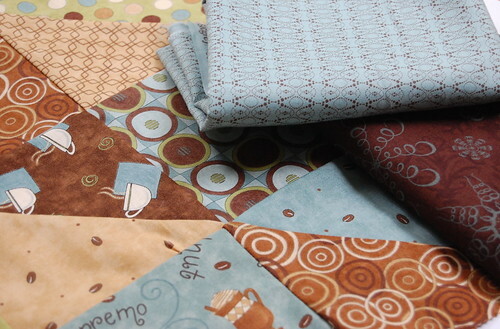 You picked some great fabrics as well, both for the quilt top and for the stash! Have a great time at Amy's. I envy you that you have such a great LNS. Mine is nice too, but I wish it were closer. Love all the pretty fabrics! I love your color changes to the Quaker Lady ~ As always your stitching is beautiful. You are amazingly fast. So much progress on the Lady PLUS a quilt! Oops forgot to say have a great time shopping and stitching at Amy's!!! Love those fabric!!!!! 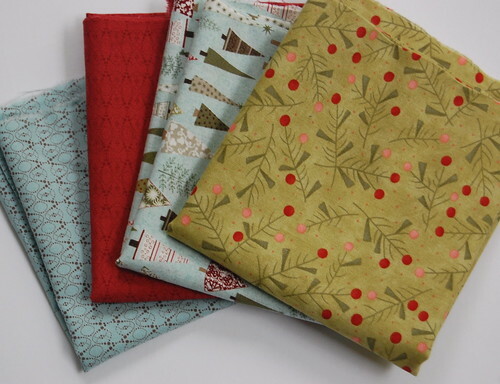 Fig tree fabrics are my favorites!!!! i love your table runner your making! and LOVE the fat quarters you picked up today. I picked a couple up today as well. Your Lady Quaker is amazing Nicole - I see a quick finish here! I hope you have a wonderful day with Amy! I could use a restful day like that! Love your fabrics and Lady Quaker is beautiful. I will have to get this pattern! Nicole, you've been bitten! That darn quilting bug got you. There's no turning back now. Oh your quaker lady is just so beautiful and the alphabet is gorgeous too. I love what you are making, the fabrics are just so nice. Can't wait to see more. I love this design, she looks great. Love the fabrics you picked up.